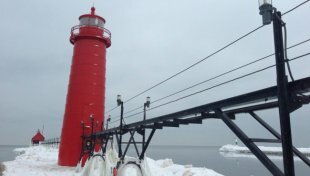 The pier at Grand Haven on Jan. 21, 2015. GRAND HAVEN, Mich. (WOOD) — In January 2013, Lake Michigan hit its lowest water mark ever. Just two years later, the big lake has seen what some are calling an unparalleled turnaround. “We’re up almost two feet from there. Last fall, we had an unprecedented event where lake levels continued to rise through the fall. It has not rebounded this quickly I think in any recorded history that we have, ” said Chris Schropp of the U.S Army Corps of Engineers. Typically, lake levels peak in July and then lower through the winter. Schropp said last year was the first time lake levels continued to rise past October. He said a combination of record snowfall, wet conditions and above average temperature contributed to the water levels rising so much. “Last year we had the ice coverage that didn’t allow water to evaporate from the lake, just snow fall, ice coverage and rain through the seasons, ” Schropp said. The current water level of Lakes Michigan and Huron — which are measured together — is 22 inches above where it was this time last year and eight inches higher than its normal monthly average. It’s not the only Great Lake that is rising. 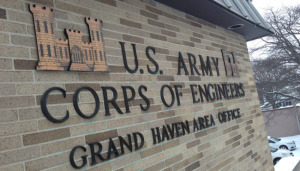 According to the U.S Army Corp of Engineers, Lake Superior is 10 inches higher than average, Lake Erie seven inches and inland Lake St. Clair is 18 inches higher than normal. 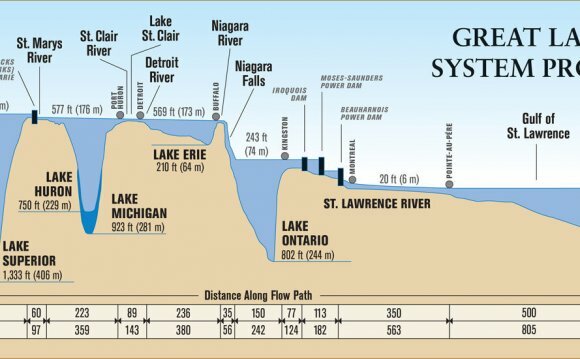 Lake Ontario is the only lake of the five Great Lakes that is below average — down by four inches. The above-average water levels have pros and cons, according to Schropp. One benefit of the higher levels ties into commercial shipping. The deeper waters mean that big ships carrying goods can take a heavier load, in turn shipping more goods. But local marinas and lakefront home owners may take the brunt of the negatives. Over the last three decades, marinas have seen water levels fluctuate by more than five feet, forcing them to raise and lower their boat slips more often, which can be pricey. Schropp says lakefront homeowners also take a blow from the rising water. “If you talk to the homeowners along the lakes and the smaller lakes, they have a lot more erosion, a lot less property, maybe more property damage if you live close to the lake. You see that when the water levels rise, ” he said. The water levels are not exactly healthy, according to Schropp, but he says Lake Michigan is better off now than it was two years ago. “Fortunately we did have that rise, so if they do go down, we should be back to average, ” Schropp said.